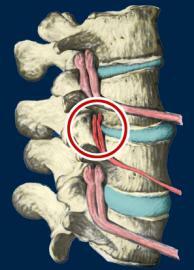 Subluxation Degeneration is seen in subluxations that have been present for up to twenty years. This phase is characterized with a loss or change in the normal curve in the spine. On this example you can see that the normal forward (lordotic) curve is lost. 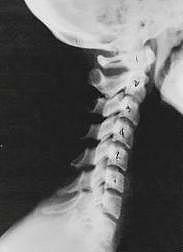 This spine even has developed a reverse curve in the neck. The disc spaces have also begun to exhibit a slight change in shape. One good point is that the bodies of each of the vertebrae (the square part in front) still exhibits clean clear borders. Segmental motion may be abnormal but overall motion is probably not affected. Chiropractic reconstructive care for a phase one can take from 6 to 18 months. More than 80% of people with Phase One Subluxation Degeneration have no pain. Therefore, if left uncorrected, phase one continues to progress with time until it eventually reaches the next phase. 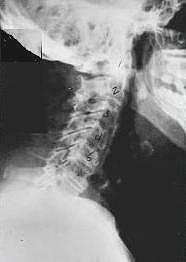 Subluxation Degeneration is caused by subluxations that have been continuing on for between 40 and 65 years. This phase has all of the attributes of the previous phases, only worse. 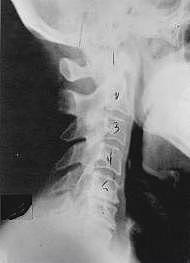 The curvatures are abnormal, the disc spaces are vastly decreased and changed. 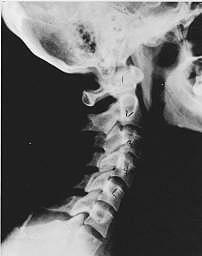 Calcium changes on the spine are abundant in this phase. Normally, people in phase three have a restricted range of motion and probably exhibit symptoms of some kind. In phase three the vertebrae show obvious changes and mutations in shape. 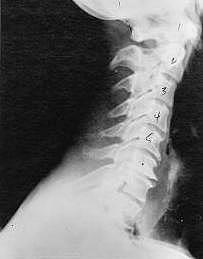 Projections made of calcium, sometimes referred to as “spurs or lipping”, can be readily seen on x-ray. Chiropractic reconstructive care for patients in phase three ranges from 2.5 years to 3.5 years. This does not mean that at the end of this time that any or all of the calcium changes will be gone. In many instances the body adapts to the presence of the calcium and positive changes can only be measured from a functional standpoint. As before, if Phase Three Subluxation Degeneration is left unchecked it slowly advances onward into the next phase.